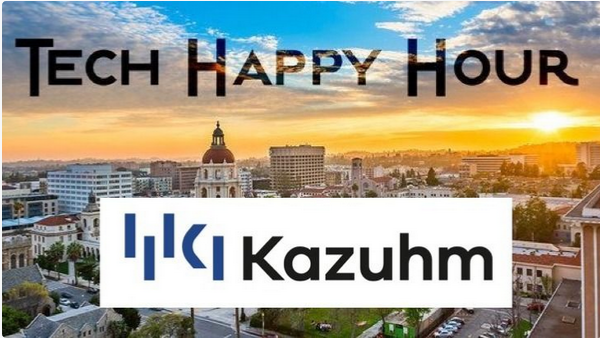 This month Pasadena Tech Happy Hour is sponsored by Kazuhm! The first 40 attendees are going to be given drink tickets and in addition to appetizers provided all evening! Kazuhm is a next generation workload optimization platform that empowers companies to maximize all compute resources from desktop to server, to cloud. Founded with a belief that organizations have become too dependent on cloud computing, while disregarding the untapped resources that already exist within their organizations today, Kazuhm securely and efficiently recaptures unused processing power to boost productivity and minimize unnecessary IT investment. As the first fully-connected, commercial grade compute ecosystem, it allows organizations worldwide to process workloads at a fraction of the cost. Global IT managers and leaders have adopted Kazuhm’s easy, centralized install process that puts resource control back into their hands. Learn more at www.kazuhm.com. We are working to build a collaborative and engaged community to develop a thriving tech ecosystem. This community will be a place where you can enjoy the company of other bright and driven individuals that share the same passion for tech and the Pasadena area. You’ll find developers, executives, career coaches, and people in related fields like real estate, finance, and other services. In short, you’ll find a place where anyone looking to get involved in their local tech community can find resources to further their vision.